“Get down!” our guide shouted as a wall of water rushed over the yellow inflatable raft, tossing it like a foam ball in a wind tunnel. I wedged my foot under the bumper seat, slid to the bottom, and hung onto the perimeter rope, hoping desperately that my oar would still be in the raft when the frothing frenzy was over. Following orders to "get down" on the bottom of the raft. Seconds later, as our rubber raft bounced away from the explosive waves, we heard the next stern command: “Paddle!” So we paddled—hard—until the swift water of the Zambezi River in Zambia, Africa relaxed into a steady flow. Our crew for this white water rafting adventure, consisted of a newlywed couple from Ireland, 20-ish couple from London, young man from Australia, and my husband Larry and me. We had just navigated “Morning Glory,” a class five rapid below Victoria Falls. Several diagonal shifts off the right hand wall of water fed into a big hole at the bottom that submerged the raft before lifting it back to the surface. But quickly the current carried our raft towards the next big rapid, Stairway to Heaven, a thrilling run characterized by a steep drop with a hole and massive waves. Everyone had oars but not everyone was effective at paddling. It’s a good thing I didn’t check the Internet before booking this whitewater trip. I might not have opted to tackle what the British Canoe Union describes as “the wildest one-day whitewater run in the world with extremely difficult, long and violent rapids, steep gradients, big drops and pressure areas.” Had I known how dangerous the Zambezi rapids can be (several people drown on similar trips every year), I might have skipped this excursion. Larry is ready to enter the raft and begin the white water adventure. But I relish challenges. On my refrigerator at home is a poster that reads Every so often, push your luck. That has become my mantra because doing so is good for both body and spirit. Besides, unforgettable experiences happen when you’re open to new adventures and willing to take a chance on yourself. Having rafted on whitewater numerous times, we looked forward to this excursion. Spectacular Victoria Falls thunders over a tall, craggy wall and crashes into a deep, narrow canyon where water rushes away in the Zambezi River, creating a perfect confluence of whitewater. When dense waves splashed overhead, threatening to wash away the rest of my life, I hoped I wasn’t pushing my luck too far. Huge waves of water engulfed our raft many times. Vincent, our guide, had the cocky confidence of a person in charge, a good thing for this crew of novices. The first rapid was a level five called The Boiling Pot. Here a wall of water forms to cushion the raft against the rocky gorge (nasty if you crash) and lifts you over the eddy. On the first attempt our crew paddled haphazardly, and we missed the current that would carry us over the rapid. We tried again, synced our paddles, and, to Vincent’s relief, successfully maneuvered through the fray. From then on we were invincible. 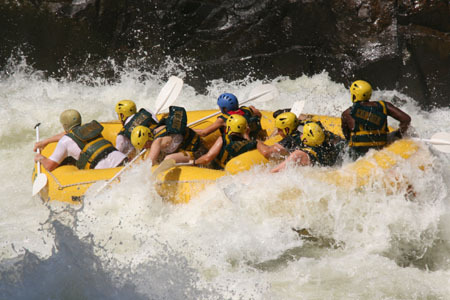 White water rafting on the Zambezi River is not for the faint of heart! Our raft stayed upright throughout the trip, and no one became a swimmer (fell into the river). With a touch of sadistic humor, the Australian fellow had threatened to sabotage the raft, so we could all experience the water first-hand. He backed off after we saw a crocodile sunning itself on the river bank. We paddled hard while riding the crescent of the waves. Number seven, a class five high volume run, was the longest and most technical rapid on our trip—so difficult that outwardly fearless Vincent made the cross sign when we successfully avoided two dangerous rocks. On the eighth rapid, our group voted to take the 50/50 spill route instead of the safer, less daring route. This took us over a challenging series of three runs that totally submerged and spun our raft like a toy boat caught under the bathtub faucet. For what seemed like minutes, we were engulfed in a towering rush of water—pushing our luck. But adrenalin kicked in, and everyone paddled furiously until we approached calmer water. Oars up salutes a successful trip. In all we navigated five class five rapids, the most difficult allowed for raft passage, plus numerous three’s and four’s. We portaged around Commercial Suicide, a class six, before tackling the last run, Gnashing Jaws of Death, from which we emerged soaked and exhausted. But it was too soon to celebrate success. Exiting the canyon required navigating a steep incline on a crude ladder built of tree branches while carrying our equipment. The adrenaline rush that propelled us through the rapids had vanished, leaving us hot, thirsty, and tired. But quitting wasn’t an option. out from the Zambezi River. Monkey-climbing the ladder on all fours, I finally reached the top. As I washed dust from my parched throat with a cool drink, exhilaration kicked in. I had pushed my luck and succeeded.